Since numerous studies, including two recent Cochrane Reviews—long recognized as the gold standard in medical research analysis—have demonstrated that glucosamine (in the form of glucosamine sulfate) and chondroitin do effectively not only reduce pain, but promote restoration of healthy joint tissue, it seems advisable to take a closer look at the evidence presented in both the Cochrane reviews and in the latest BMJ paper whose authors are now pronouncing an opposite conclusion. The 2001 Cochrane review identified 16 randomized controlled trials (RCTs) which provided evidence that glucosamine is both effective and safe in osteoarthritis (OA). Glucosamine was compared to placebo in 13 of these RCTs and was found to be superior in all except one. In four of the 16 RCTs, glucosamine was compared to an NSAID and was found to be superior in two and equivalent in two. 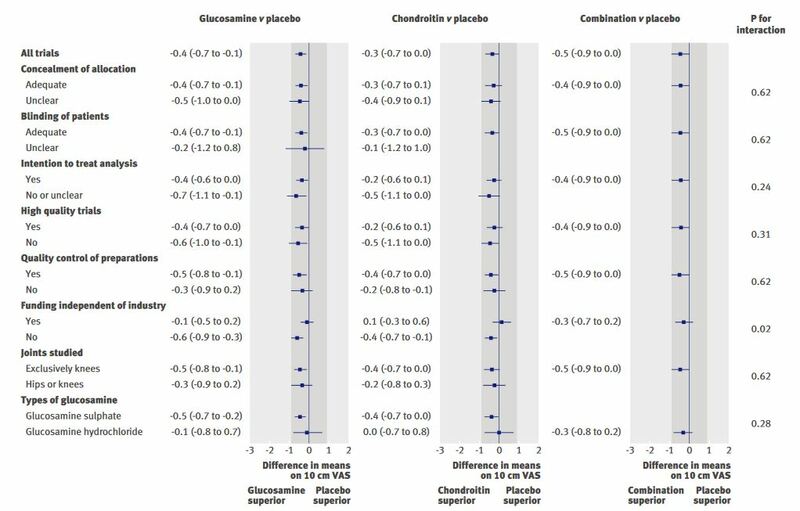 The second Cochrane review (2005) included 20 RCTs and found glucosamine significantly better than placebo with, from baseline, a 28% improvement in pain and a 21% improvement in function.4 In the 10 RCTs in which the Rotta preparation of glucosamine (glucosamine sulfate [aka sulphate]) was compared to placebo, glucosamine was found to be superior for pain and function. In contrast, pooled results for pain and function in those RCTs in which a non-Rotta preparation of glucosamine (glucosamine hydrochloride) was compared to placebo did not reach statistical significance. In the four RCTs in which the Rotta preparation (glucosamine sulfate) was compared to an NSAID, glucosamine was superior in two, and equivalent in two. Furthermore, two RCTs using the Rotta preparation showed that glucosamine was able to slow radiological progression of OA of the knee over a three year period. Unlike NSAIDs, which are well known to cause intestinal bleeding, peptic ulcers and cardiovascular thromboembolic events with long term use,56 glucosamine was as safe as placebo. In the article published in BMJ September 13, 2010, Jüni et al. 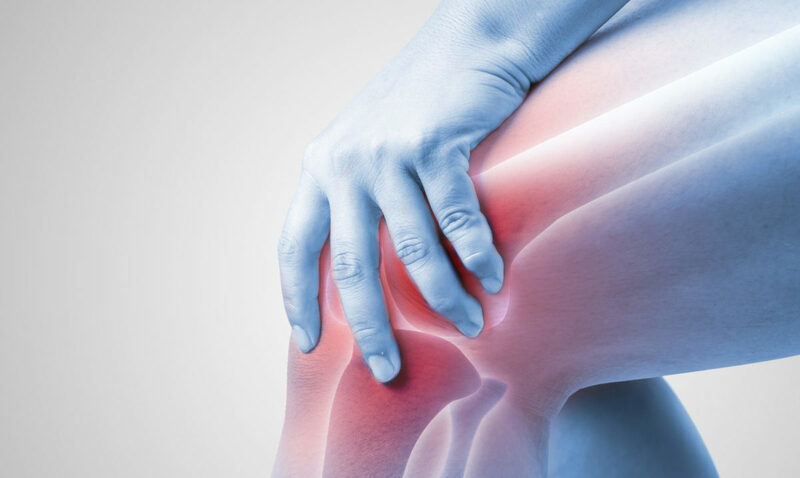 analyzed the results of 10 published trials involving 3,803 patients with knee or hip osteoarthritis. While mentioned neither in the press release nor noted in the abstract of this paper, half of the trials chosen utilized glucosamine hydrochloride. Not surprisingly, in all of these studies, glucosamine hydrochloride produced marginal benefit compared to placebo. In contrast, in the 5 trials in which glucosamine sulfate (aka sulphate) was used, it was clearly superior to placebo. Combining the results of the 10 trials produced an “average” that drags down the overall value, washing out the benefit demonstrated by glucosamine sulfate. This then allowed Jüni et al. to claim they found no clinically relevant effect of chondroitin, glucosamine, or their combination on perceived joint pain or on joint space narrowing, despite the fact that the data presented in Figure 3 in their article clearly reveals this was not the case. Chart Adapted from Jüni et al., Figure 3 Stratified analyses of differences (95% confidence interval) on 10 cm visual analogue scale (VAS) in pain intensity between experimental interventions and placebo. Shading represents area of clinical equivalence. Negative values indicate benefit of experimental interventions compared with placebo. We suggest a bit of health-promoting skepticism and a thorough reading of the full paper when one highly publicized article asserts a finding that flies in the face of numerous respectable reviews. In addition to the Cochrane reviews, a number of other reviews published since 2005 have confirmed that treatment with glucosamine sulfate and chondroitin should be recommended as first-line therapy for OA. In contrast, the most recent follow up on the GAIT showed little to no efficacy for glucosamine and chondroitin. This article—Sawitzke AD, Shi H, Finco MF, et al. (2010)11—reports the negative outcome of a 24-month, double-blind, placebo-controlled study involving 662 patients that was conducted at nine sites in the US ancillary to the Glucosamine/chondroitin Arthritis Intervention Trial (GAIT). Its stated purpose: to evaluate the efficacy and safety of glucosamine and chondroitin sulfate, alone or in combination, as well as celecoxib and placebo on painful knee OA over 2 years. Its results: Glucosamine produced pain relief comparable to celecoxib. Compared with placebo, the odds of achieving a 20% reduction in pain were celecoxib: 1.21, glucosamine: 1.16, combination glucosamine/chondroiton sulfate: 0.83 and CS alone: 0.69. The conclusion drawn: Over 2 years, no treatment achieved a clinically important difference in WOMAC pain or function as compared with placebo. Guess which form of glucosamine was used: glucosamine hydrochloride. Why is glucosamine sulfate, but not glucosamine hydrochloride, likely to be effective in treating OA? In all the papers in which the question is raised as to the mechanism of action through which glucosamine may serve as an effective treatment for OA, the “answer” given is that the mechanism is unknown. What do we know? Sulfur is an essential component of cysteine, the rate-limiting peptide in glutathione formation. Not only is glutathione acting as a reducing agent through its sulfhydryl (-SH) moiety, but many other key cellular enzymes use prosthetic groups ending with -SH moieties to handle reactions involving acyl-containing biochemicals: two examples, both of which are essential for healthy mitochondrial function, are coenzyme A and alpha-lipoic acid. Sulfur is also required for both glucuronidation and sulfation, key Phase II detoxification reactions that transform xenobiotic compounds (many drugs and environmental toxins) into a form in which they are able to be excreted from the body. NSAIDs are primarily detoxified via glucuronidation. Treatment with Glucosamine Sulfate is a Reasonable Option for Patients with OA. In the numerous trials that have demonstrated benefit versus OA with glucosamine, most utilized glucosamine sulfate (500 mg orally t.i.d. ), and most noted improvements after 30 to 90 days of therapy.